NAMM 2015: Will Auria Pro be the ultimate iPad audio/MIDI DAW? 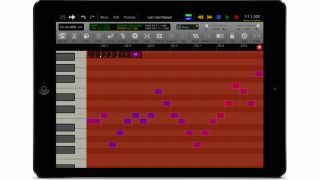 Auria Pro features a piano roll for MIDI editing. NAMM 2015: Auria has long been regarded as the most 'pro level' iPad DAW if you work exclusively with audio, but MIDI recording and editing have been conspicuous by their absence. Now developer WaveMachine Labs is seeking to "raise the bar in mobile recording" by offering these and other new features in Auria Pro. This promises not only MIDI sequencing and a piano roll editor but also "real-time audio warping, powerful audio routing, two built-in synths, and much more". One of those synths is FabFilter's Twin 2, a well-loved Mac and PC plugin. It's said that all of the original Auria's features have been retained, too - check out the feature list below for further details of what's new, or head to the Auria blog. Auria Pro will be released in the Spring priced at $49.99. We're told that existing Auria users will be able to upgrade for a reduced price.